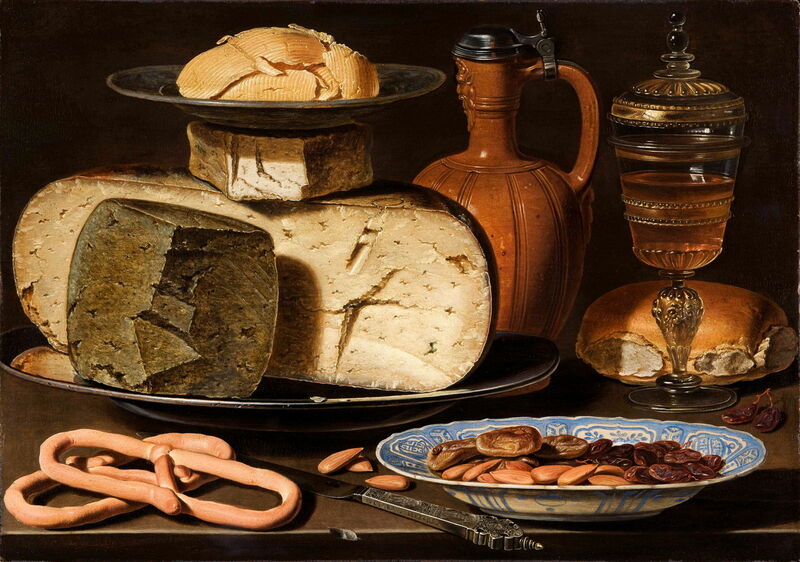 Clara Peeters (fl 1607-1621), Still Life with Cheeses, Almonds and Pretzels (c 1615), oil on panel, 34.5 x 49.5 cm, Koninklijk Kabinet van Schilderijen Mauritshuis, The Hague, The Netherlands. Wikimedia Commons. The early seventeenth century was a time of conflicting ideas. On the one hand, the Netherlands had entered its Golden Age, in which it was the foremost maritime and economic power in Europe, and enjoying rising living standards if not wealth. On the other hand, contemporary religious thought, which pervaded life, held that worldly goods, possessions, and pursuits were futile and empty: “vanity of vanities, all is vanity”. It was also a world in which women had fairly rigidly-defined roles. Trying to pursue a career as a woman artist was by no means impossible, but there were strict limitations. Most constraining was the inability of women to learn to paint the figure from life, which pretty well ruled out all the genres which involved painting people. So women in art were limited to painting flowers, or still lifes, the least prestigious of the genres. 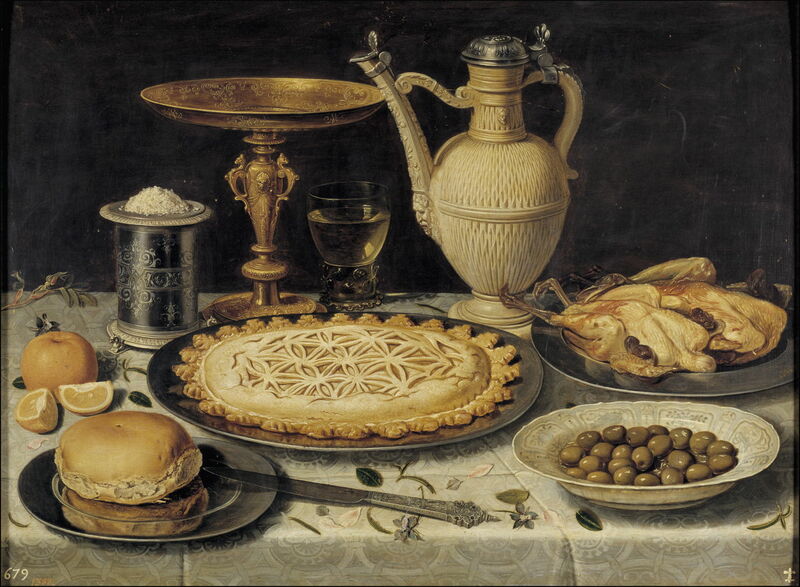 Clara Peeters was one of the finest still life painters of any age. We don’t even know when she was born, but she seems to have trained in Antwerp, then pursued her career successfully in the Dutch Republic. She appears to have been internationally successful by 1611, when at least four of her paintings were sold to Spain. Her last reliably-dated works are from 1621, although there are a few paintings which have been attributed to her from later. No one knows whether she stopped painting when she married, or when she died. 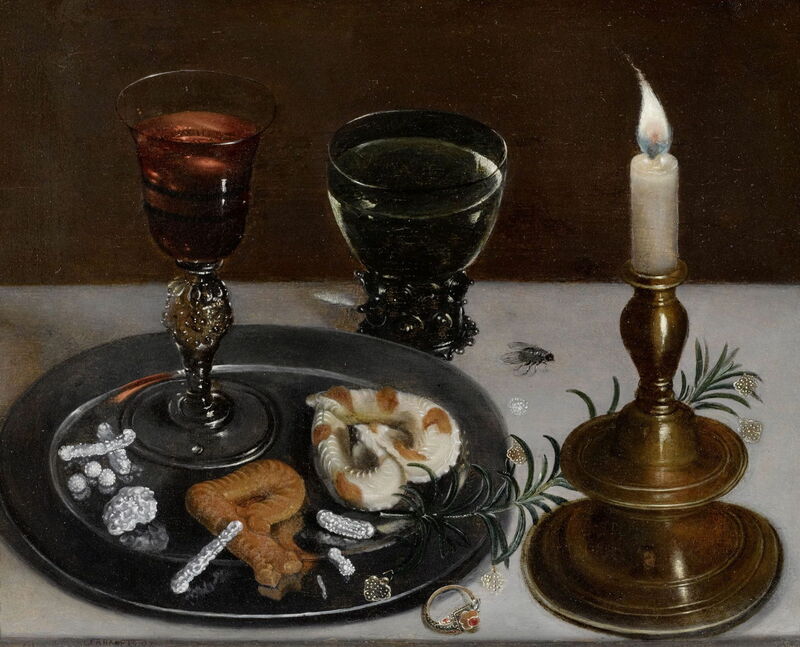 Clara Peeters (fl 1607-1621), Still Life with Venetian Glass, Roemer and a Candlestick (1607), oil on panel, 23.7 x 36.7 cm, location not known. Wikimedia Commons. Venetian Glass, Roemer and a Candlestick (1607) is one of her earliest known works, which shows an extraordinary skill in rendering the varied surfaces and their optical properties. 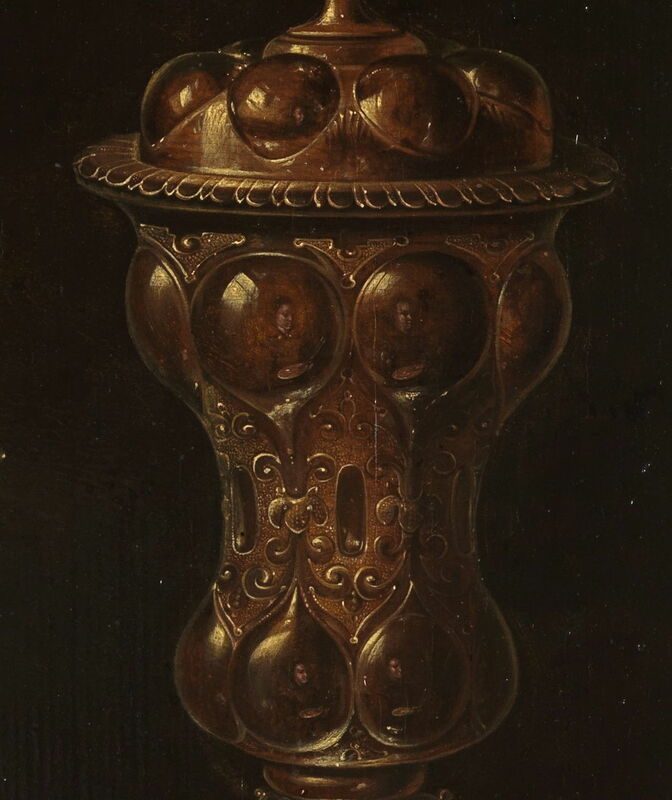 It is also one of the first still lifes in which the artist has included their own image reflected in the motif, here the base of the candlestick holder. As in many still lifes, its contents have interesting symbolic meaning. The confectionery shown is sweet and ephemeral, the ring a sign of earthly riches and temporal relationships, the fly an indicator of earthly decay, and the burning candle combines remembrance with the strict limits on lifespan in this world. This is not just a still life, but an expression of vanitas, the futility and limits of our earthly existence. Her paintings from 1611 which ended up in the Spanish Royal Collection, and are now in the Prado, leave the stern moral message behind. Clara Peeters (c 1594-1640), Mesa (Table) (c 1611), oil on panel, 55 x 73 cm, Museo Nacional del Prado, Madrid. Wikimedia Commons. 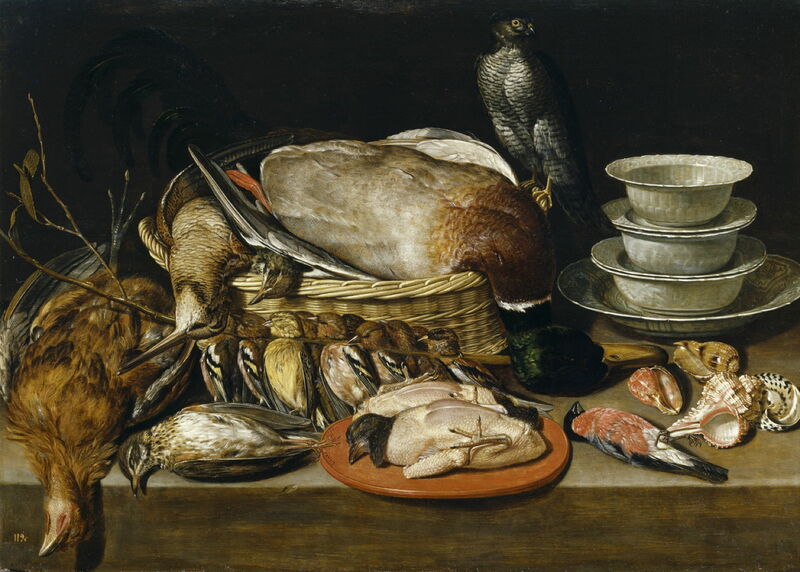 Clara Peeters (fl 1607-1621), Still Life with Game Piece and Poultry (1611), oil on panel, 52 × 71 cm, Museo Nacional del Prado, Madrid. Wikimedia Commons. 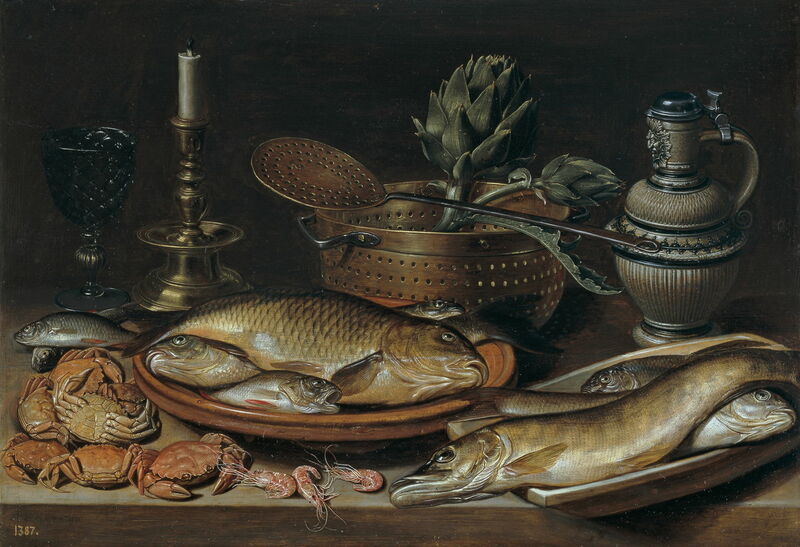 Clara Peeters (fl 1607-1621), Still Life of Fish and a Candlestick (1611), oil on panel, 50 x 72 cm, Museo Nacional del Prado, Madrid. Wikimedia Commons. Clara Peeters (fl 1607-1621), Still Life with Flowers, Goblet and Dainties (1611), oil on panel, 52 x 73 cm, Museo Nacional del Prado, Madrid. Wikimedia Commons. In the last of these, Clara Peeters makes another cameo appearance in its reflections, providing tantalising glimpses of herself. Clara Peeters (fl 1607-1621), Still Life with Flowers and Gold Cups of Honour (1612), oil on oak, 59.5 x 49 cm, Staatliche Kunsthalle Karlsruhe, Karlsruhe, Germany. Wikimedia Commons. The following year, her still life with Flowers and Gold Cups of Honour (1612) reveals multiple miniature self-portraits reflected in the gold cup at the right. These are shown more clearly in the detail below. Clara Peeters (fl 1607-1621), Still Life with Flowers and Gold Cups of Honour (detail) (1612), oil on oak, 59.5 x 49 cm, Staatliche Kunsthalle Karlsruhe, Karlsruhe, Germany. Wikimedia Commons. In her still life with Cheeses, Almonds and Pretzels from about 1615, her surface and optical rendering reaches the amazing, and all thoughts of vanitas are forgotten. This is a celebration of the very earthly sensuous pleasures of food. These are sustained in several of her other later paintings, shown below. 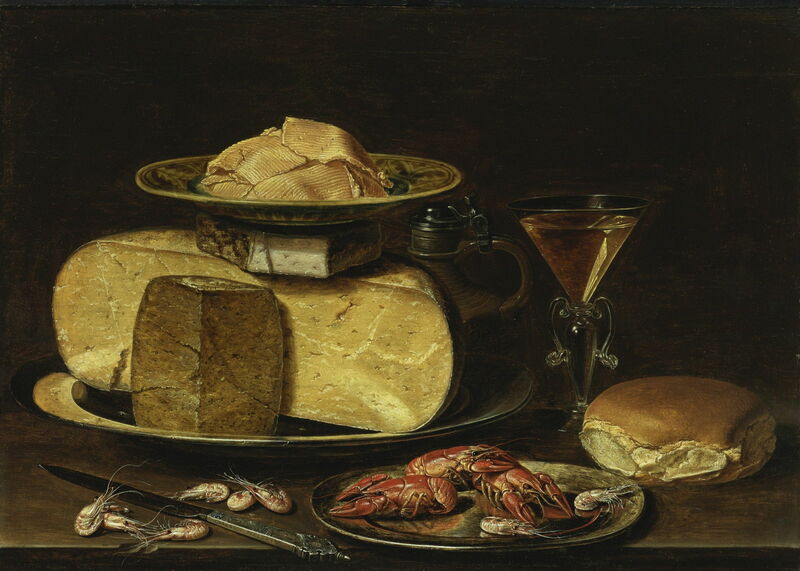 Clara Peeters (c 1594-1640), Cheesestack with Knife, Shrimp, Crayfish, Glass of Wine and Bread (c 1625), oil on panel, 40.8 × 57.9 cm, location not known. Wikimedia Commons. 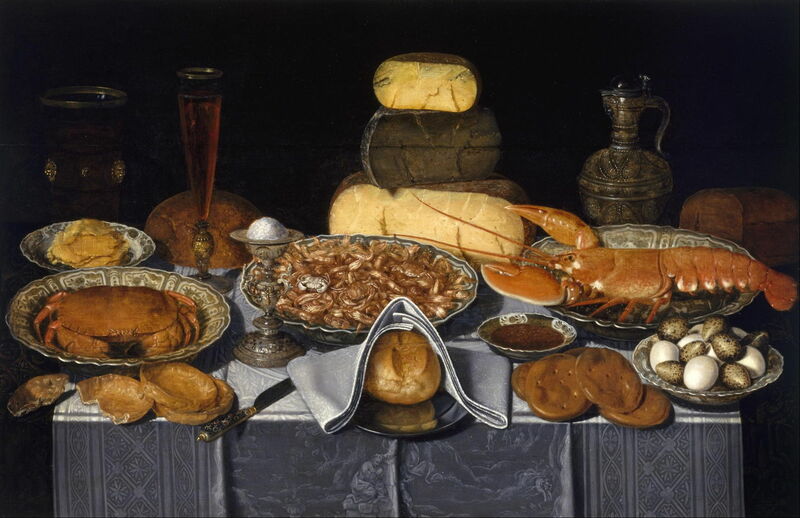 Clara Peeters (fl 1607-1621), Still Life with Crab, Shrimps and Lobster (c 1635-40), oil on wood, 70.8 x 108.9 cm, Museum of Fine Arts, Houston, TX. Wikimedia Commons. 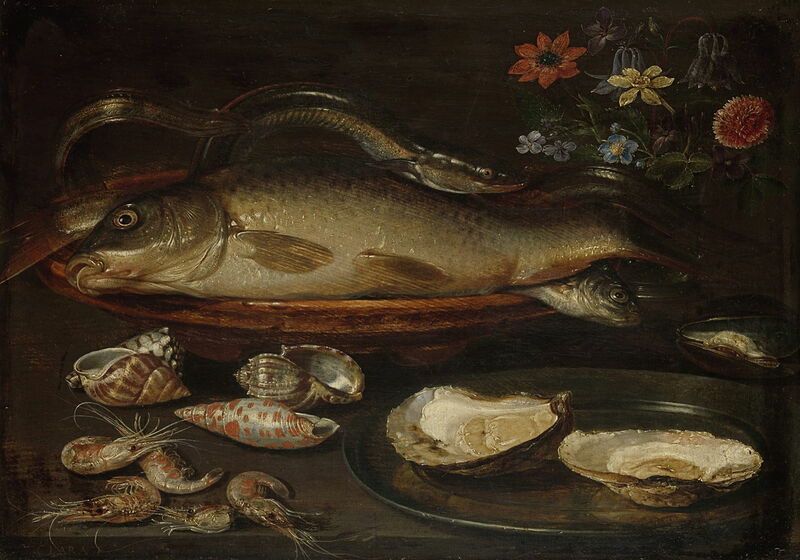 Clara Peeters (fl 1607-1621), Still Life with Fish, Shrimp, Oysters and Crayfish (c 1612-21), oil on oak panel, 37.7 x 49.9 cm, Koninklijk Museum voor Schone Kunsten Antwerpen, Antwerp, Belgium. Image by Sandra Fauconnier, via Wikimedia Commons. 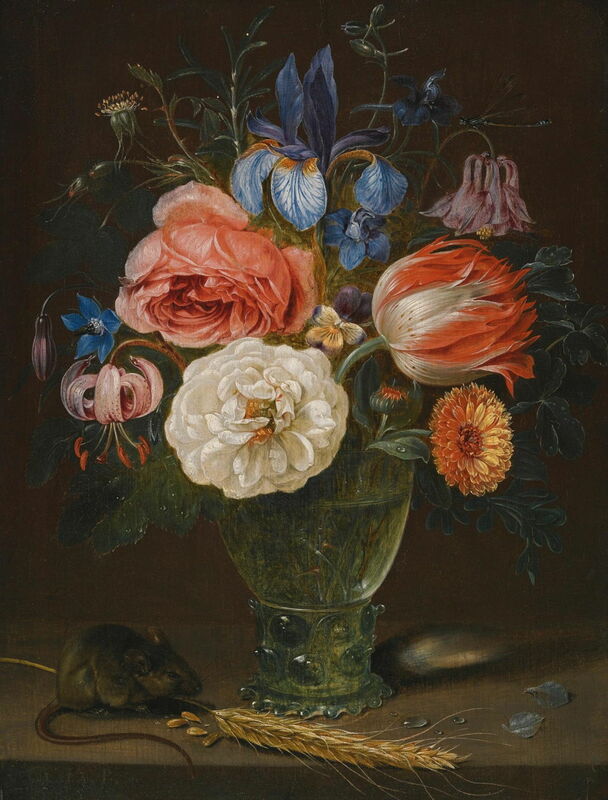 Clara Peeters (fl 1607-1621), Still Life Of Flowers In a Roemer With a Field Mouse And An Ear Of Wheat (date not known), oil on panel, 27 x 21 cm, location not known. Wikimedia Commons. She had not entirely forgotten the spiritual dimension, though. Two of her most interesting paintings return to the concept of vanitas. Clara Peeters (fl 1607-1621), Still Life of Fruit, Dead Birds and a Monkey (1615-20), oil on panel, 47.4 x 65.6 cm, Private collection. Wikimedia Commons. 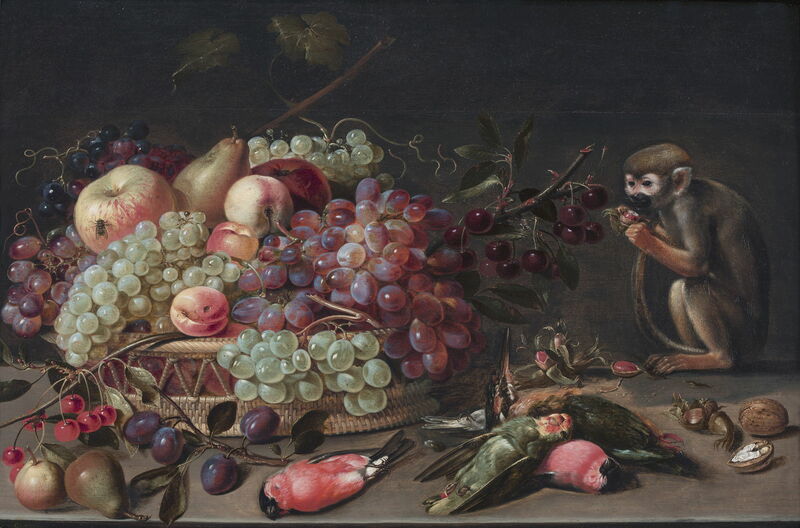 Her Fruit, Dead Birds and a Monkey (1615-20) shows a more peculiar collection of objects: the grapes are covered with bloom, a peach is going rotten, and there’s a fly on an apple. The little monkey, busy feeding from nuts, is gazing at a small pile of dead birds. There are no glass or metal surfaces to show off Peeters’ painting skills either. Clara Peeters (fl 1607-1621), Vanitas Portrait of a Woman (Self-Portrait?) (c 1618), oil on panel, 37.2 x 50.2 cm, location not known. Wikimedia Commons. Finally, what we must assume is a Vanitas Portrait of a Woman, almost certainly a self-portrait, from about 1618. The artist gazes into the distance, probably a carefully-angled mirror which she used to see her own reflection. She is around thirty years old, and prospering. 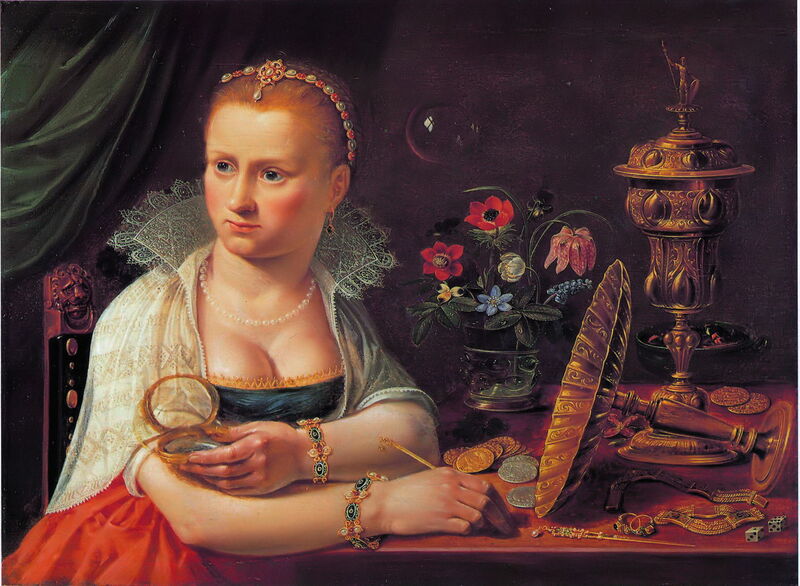 Beside her head is a bubble, a sign that this is a vanitas painting. 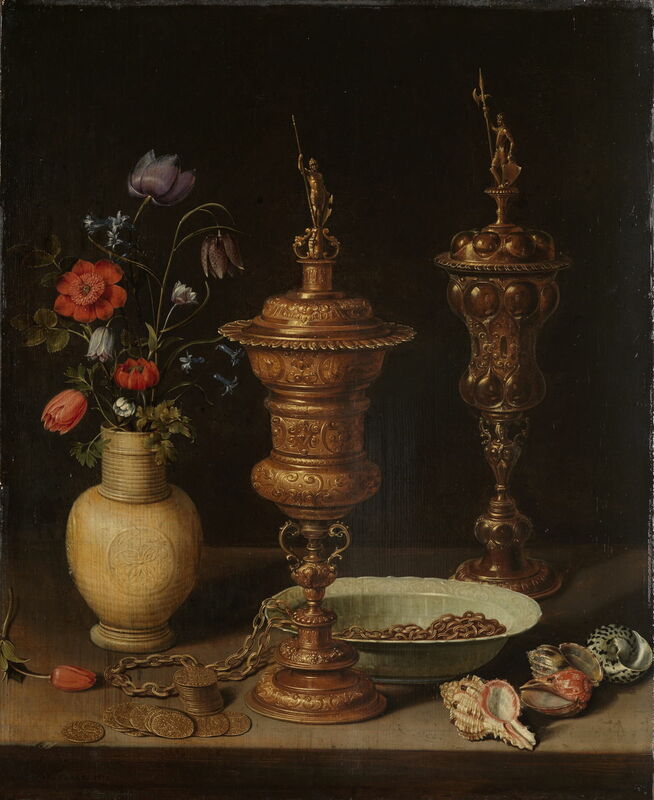 In front of her, on the table, are the contents of a still life, including the goblet from Still Life with Flowers, Goblet and Dainties (1611) above. In addition, there are the symbols of the vanitas: gold and silver coins, jewellery, a couple of dice, with their association with chance and earthly pleasures such as gaming. 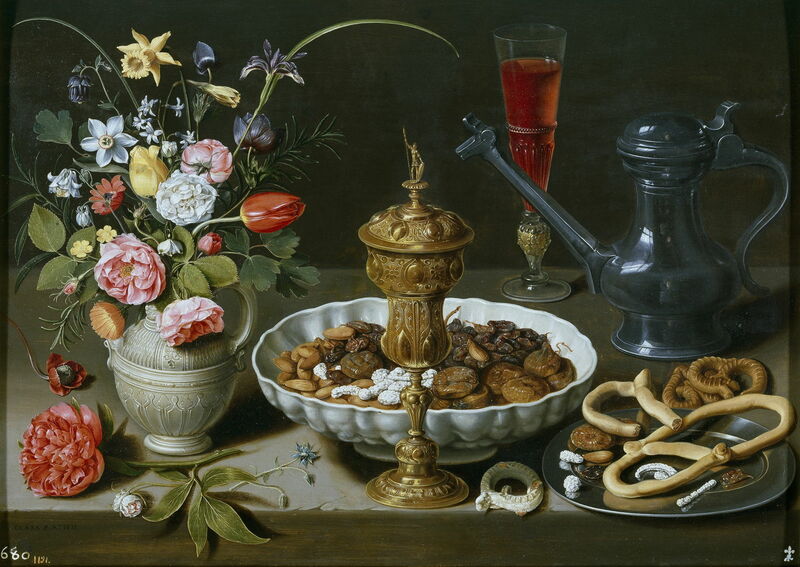 It’s a tragedy that Clara Peeters was never able to try figurative painting. But these still lifes are a reflection of her supreme skills as a painter, and small insight into the contradictions of her time. Posted in General, Life, Painting and tagged Golden Age, painting, Peeters, still life, vanitas, women in art. Bookmark the permalink. Thank you – they are superb.